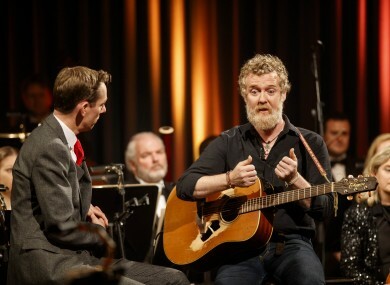 GLEN HANSARD HAS said that the group Home Sweet Home wants to start a ‘national conversation’ about homelessness after the group took over Apollo House in Dublin to house the homeless. The Oscar-winning singer-songwriter was speaking to Ryan Tubridy on The Late Late Show tonight about his involvement with the group, as well as ‘Operation Nama’. Home Sweet Home, a coalition of housing groups, trade unions, musicians and actors, took over the Apollo House late on Thursday night. “We are involved in an act of civil disobedience. I call upon the very spirit of the Irish people to look at this, it is an illegal act. We have taken a building that essentially belongs to the people of Ireland and that has been lying empty.” said Hansard. The Government will shelter 200 people this Christmas and there’s 260 people between the Royal Canal and the Grand Canal in Dublin. Hansard confirmed on The Late Late Show, to loud cheers from the audience, that the group is occupying the building “illegally”. According to Hansard, Home Sweet Home wants to start a ‘national conversation’ about homelessness, saying that the crisis should be considered a ‘national emergency’. Hansard told Tubridy that the action came about through conversations with different artists and friends over the year. “So I find myself now part of group called Home Sweet Home. It is a group of artists, a group of friends, a group of people that we know and love”. Like minded souls. Jim Sheridan… Andrew Hozier, Saoirse Ronan, Christy Moore. Mattress Mick has been great, he has really helped us out a lot. He has donated a lot of beds. The Apollo building was formerly used for offices by the Department of Social Protection but has been left vacant for the last year. It was planned to be demolished and rebuilt as an office block. In a statement released by the Irish Housing Network, they said that the building would “provide safe and secure accommodation to the most vulnerable people in Irish society, those sleeping on our streets”. When asked what would happen if the group were told to vacate the property by the authorities, Hansard appealed to the better nature of the Government and Nama. “If everybody pays tax in this audience, if anyone knows their stuff they know that that is essentially our building. We are just going to take it for a few months” said Hansard. A spokesperson for Nama has said it did not own the Apollo House and any issues arising are for the receiver of the building and not Nama. Email “Glen Hansard says the taking over of Apollo House is an 'act of civil disobedience'”. Feedback on “Glen Hansard says the taking over of Apollo House is an 'act of civil disobedience'”.